Let’s have a quick re-cap on where everything fits together in our 3-tier LightSwitch project. Figure 1 shows which parts of our software go where and how they interact. The SQL server stores all of the tables created when you choose Add New Table in a LightSwitch project in Visual Studio. The code we have written in part 2 to enforce permissions checking and keep the internal user database synced with our user profiles table is called business logic and is essentially the code you write in C# or VB.NET that is attached to any tables (or queries) you create. This code always runs on the server no matter where a particular request comes from, so there is no backdoor around executing the business logic. This is good because it makes sure everything stays consistent and that we don’t have to implement different rules or code for different clients. The LightSwitch server code exposes OData endpoints which represent XML or JSON-formatted views onto each table (or query); by using HTTP GET, POST, PUT and DELETE methods we can emulate the functionality of SQL SELECT, INSERT, UPDATE and DELETE statements respectively, using the OData query syntax discussed in part 2. When we call one of these methods, any associated business logic you have written will be executed – so for example, when we try to add a new user via OData (an HTTP POST method to UserProfiles in our example project), the business logic will check that the current user has permission to do this, and complete the automatic role assignment and other tasks we implemented in part 2. 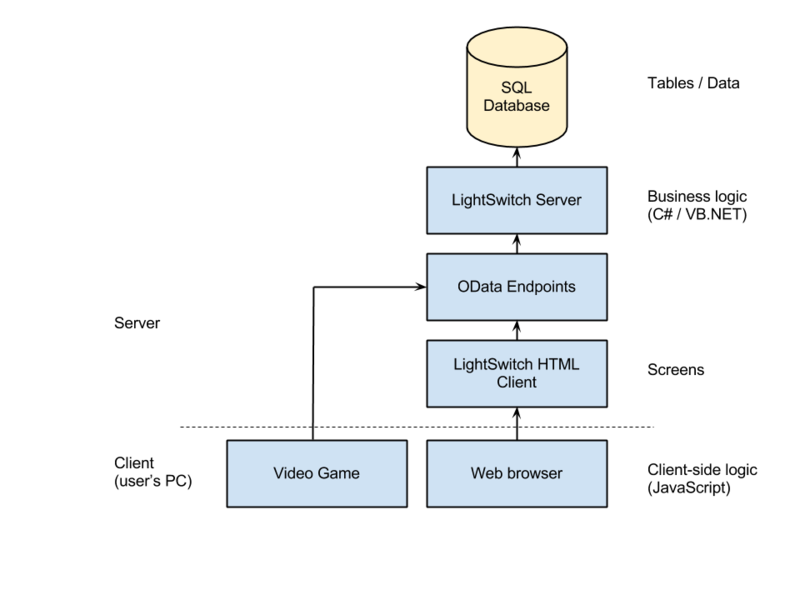 As discussed earlier, when we come to write the game client itself, all of its communication with the LightSwitch application will be via OData, and so far we have therefore concentrated on learning about how to use OData and make sure our OData endpoints are secure. We will very likely, however, want to provide the user with a web-based interface to perform tasks that we don’t necessarily want to implement straight into our game, for example updating their email address, managing their friends list, browsing leaderboards on a web page and so on. This is where the LightSwitch HTML Client comes in, and is what we shall be focusing on in this article. The LightSwitch HTML Cient is a RAD (Rapid Application Development) tool specifically designed to let us very quickly create forms-over-data type applications, that is to say, HTML forms which let you add or edit a row of a specific table in the database. When you deploy an HTML Client from Visual Studio, LightSwitch builds a web site which you can then visit to access these forms. By customising the behaviour of the HTML Client, you can make it do more or less whatever you want. The fundamental unit of a LightSwitch HTML Client is the screen. A screen is basically the interface over the table data. It can be a web page, a dialog box or a pop-up. There are a few basic types of screens for browsing a list of records (rows), viewing a single record or adding/editing a record, however any screen can be customized with any desired amount of code if the basic templates don’t suit your needs, and we shall look at some examples of this below. Screens have two main categories of items: data items and layout items. The data items are the table rows, fields and any local variables (known as local properties) you define for the screen. This may include data that has been passed to the screen by another screen or piece of custom code, and these data are known as parameters. Layout items are comprised of the controls used to represent these data items in the web page, as well as various dividers, tabs, bars and any buttons you add. Not all of the data items have to be visible in the layout, and the way the visible items are displayed can be customized. If you want to create custom actions, you can add buttons which execute your own custom code. The project we will start with in this article is that we have at the end of method 3 in part 2 of the series. We’ve got our UserProfiles table and all the associated business logic we need to make it work properly. We have also deployed an HTML Client with a simple Welcome screen which you can see by visiting yourwebsite.com/HTMLClient/. We will use this as a starting point to build our user interface. Let’s start with the easy stuff first. By default, the HTML Client is deployed into a sub-folder of your web site called /HTMLClient. There is no easy way to change this, and having to append the folder name to your site URL isn’t very professional, so let’s start by fixing it so that when you visit yourwebsite.com you are automatically re-directed to yourwebsite.com/HTMLClient/. We will do this by adding a page to the project’s root folder which redirects to the desired page, and set this new page as the default page to load. Right-click GameNetwork.Server and choose Add -> Web Form (if Web Form isn’t one of the options, select New Item… and pick it from the list). Call it default (the name is important here, don’t change it to something else!). The new HTML form default.aspx will open in the code editor. Right-click in the document or on default.aspx in Solution Explorer and choose View Code. Some auto-generated code will appear, including an empty Page_Load function. This creates the re-direct page. We now have to configure the application to use this page by default when no other path is specified in the URL. In the GameNetwork.Server node in Solution Explorer, double-click Web.config to open it. This will cause default.aspx to be loaded if no leaf filename is supplied in the URL. Since we have just created a file with this exact name in the root of the web site, visiting the web site’s base URL yoursite.com will now cause default.aspx to run, which will in turn redirect to yourwebsite.com/HTMLClient/. Test this works by publishing the project and navigating to your base URL. If all went well, you should be greeted by your LightSwitch application’s welcome screen or a login page. By default, when an error occurs in the LightSwitch HTML Client, you get a rather unhelpful error message saying that the web server configuration is preventing an error from being displayed. More specifically, errors will be shown if you connect to the server locally (ie. via localhost) but if you are debugging a LightSwitch HTML Client you have deployed on a remote server and viewing via your own PC’s browser, error details will be suppressed for security reasons. You will now be able to see the full error messages, stack traces and so on when an error occurs in the HTML Client. Do not forget to remove this when deploying a production server. At this point we want to make a screen to allow the user to view their own profile, and this is where some of the quirks of LightSwitch start to kick in. Showing all the fields in a single row of data – as is the case for our user profiles where each user has one row in UserProfiles, identified by their UserName – is usually done by creating a View Details screen, which would in our case use the UserProfiles table (entity set) as its source data. To make the screen appear, we have to pass in an existing UserProfile (row / entity) or a flag specifying that a new one should be created from wherever we are navigating from, so that the screen knows which row (entity) to display. The query we create here will be used as the source data for our view profile screen. In the Properties pane, change Number of Results Returned from Many to One. This query inherits the filter we have already defined on the table in part 2, and since we haven’t made any other modifications, returns a single row (entity) consisting of the profile for the current user, just as we would get if we queried the table directly. All – this represents all of the rows in a table (after any filter code from TableName_Filter has been applied) and is the data set type you get when you retrieve data from a table directly. Set – this represents any sub-set of the rows in a table (possibly all rows, N rows, one row or no rows) and is the data set type you get when you retrieve data from a query attached to a table whose Number of Results Returned property is set to Many. Single – this represents exactly one row (no more or less) and is the data set type you get when you retrieve data from a query attached to a table whose Number of Results Returned property is set to One. And herein lies the rub: you can only create a browse screen based on data sets of the All or Set data set types, and you can only create view screens and edit screens based on data sets of the Single data set type. Since retrieving rows from the UserProfiles table directly will return an All data set type, we cannot use it as the data source for a view screen despite the fact UserProfiles_Filter ultimately forces any direct read on the table to return only a single row (the current user’s profile). Instead, we have to make a new query with no additional code and change its Number of Results Returned property to One so that it yields a Single data set type, as we did above. Immediately, there is a problem. Normally we would now choose to add a screen, select View Details Screen, choose CurrentUserProfile as the screen data and click OK. The problem here is that LightSwitch expects any row to be displayed on a view or edit screen to be passed in as a parameter; that is to say, the view and edit screens themselves do not query to find the row to view or edit, rather they are passed in by the caller (screen or code) that navigated to the view or edit screen. When you create a screen in this way, CurrentUserProfile will be set as an input parameter and a compatible row (ie. a previous query result from CurrentUserProfile) must be passed in. If you disable the behaviour by unchecking the Is Parameter box on the CurrentUserProfile data item in the screen designer, you just end up with an empty, un-populated row. The only screen type which runs a SELECT-style (row retrieval) query in this way is the Browse screen type. If we had followed the steps above, then deleted the CurrentUserProfile item and re-added it, it would be added as a regular query to be executed while the page loads, effectively transforming the screen into a Browse screen type. So rather than wasting our time going through all that, we might as well just create a Browse screen in the first place. Wait! Didn’t you just say that we made the CurrentUserProfile query so that it would return a Single data set type that is compatible with View Details screens? So why are we now making a Browse screen? Yes, but we will also be allowing the user to modify their profile row with an Add/Edit Details screen type and that also requires a Single data set type item, which we will be passing in as a parameter from the query result from CurrentUserProfile via our Browse screen. Also, if we query UserProfiles directly on a Browse screen, even though there will only be one row because of our filter, the row will be presented as a ‘list of one’ which can be clicked on in its entirety (if you don’t understand what I mean, try it!). If this all seems pretty bizarre and non-sensical, bear in mind that LightSwitch has no way to know that we have filtered UserProfiles such that it only ever returns one row, or that the row returned is always the same for a given logged in user. In traditional data environments (ie. master-detail record views and editing), LightSwitch’s paradigms work really well – as we will see when we come to deal with leaderboards and such – but for anonymous users to be able to make accounts and then edit them in isolation is not really what LightSwitch is designed for, so we are working a little bit out of the box here. Right-click on HTMLClient in Logical View in Solution Explorer and choose Add Screen. Select a Browse Data Screen, set the name to ViewUserProfile, leave the Screen Data as None and click OK.
Add the query to fetch the current user’s profile: Click Add Data Item… in the toolbar, select the Query radio box, choose CurrentUserProfile and click OK. Build the layout by dragging UserName, FullName and Email (but not the Password field) from the data item pane into the layout designer underneath the Command Bar item. Now re-publish your project and log in. If all has gone well there should be a Show View User Profile button on the Welcome screen, and when you click it, your user profile should be displayed on a new page. Select the edit option under the Choose an existing method drop-down (CurrentUserProfile.edit will be displayed in the drop-down box). The Navigate To box will be set to (New Screen…), click OK to proceed. Change the screen name to EditUserProfile and click OK.
You have now created an edit profile dialog and a button on the ViewUserProfile screen which causes the dialog to pop up when the button is clicked. 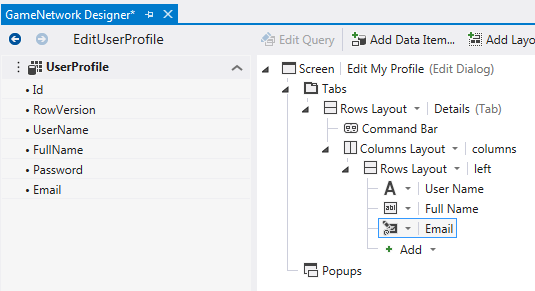 Notice that if you click on the UserProfile data item in the EditUserProfile screen designer, its Is Parameter check box is ticked, meaning that it will receive a UserProfile entity (row) from the calling screen, ie. the one selected by our CurrentUserProfile query when ViewUserProfile is displayed. We don’t want the user to be able to edit their user name so click the control type drop-down arrow on the left of User Name in the EditUserProfile screen designer and change it from Text Box to Text. This effectively changes the way the field is rendered to be a static label rather than a text edit box. We don’t want the password field to be displayed (it will be blank anyway due to the way we designed the table) so click on it in the screen designer and press Delete (or right-click and choose Delete from the menu) to remove it from the screen. Re-arrange the layout to your liking by dragging the fields around. By default the fields are shown in two columns; I removed the second Rows Layout group so that there is just one column, and changed the Display Name of the screen to Edit My Profile. You should end up with something like the display in figure 2. Note on email addresses: Email address fields can be edited with the Email Address Editor control which ensures a valid email address is entered. If your Email field has been displayed with a Text Box by default, you may need to change the type of the Email field in the table from String to Email Address. Do this by opening the UserProfiles table designer and change the type of the Email field with the drop-down selection box in the Type column. This will automatically change the edit control type to Email Address Editor in the EditUserProfile screen, and the view control type to Email Address Viewer in the ViewUserProfile screen (the viewer allows email addresses to be clicked as a hyperlink; if you don’t want this behaviour, change the control type to Text). This is where things get a bit tricky. What we would like to do is present the commonly seen update password-type dialog where the user must enter their old password correctly, then a desired new password into two boxes (to confirm they have typed it correctly) (see figure 3). The password must then be changed in the intrinsic user database of the LightSwitch application (SecurityData) without changing the UserProfiles table, yet at the same time we need the user’s UserName so that we know which user to update. We need to provide both client-side validation (for a smooth user interface experience) and server-side validation (for security). If there is a validation problem we would like to present an error message in the dialog itself. If we create a standard Add/Edit Details screen, LightSwitch provides a Save button (the floppy disk-in-a-circle icon by default) which will attempt to update the row being edited in UserProfiles. While we could certainly add server-side code to UserProfiles_Inserting to process a password change, this is messy because there is no field in UserProfiles in which to supply a previous password (nor would we want one as this makes no sense from a table design standpoint), and the actual write to UserProfiles would need to be suppressed. You can fudge the supply of an old and new password by merging them with a delimiter character in the Password field supplied to UserProfiles_Inserting, but this is really a sloppy way of coding and we are better off creating a new execution path altogether for password changes. Now we know what screen type to use, let’s focus on making the user interface first and the implementation details afterwards. Select Browse Data Screen, change the screen name to ChangePassword, leave Screen Data blank and click OK to create the change password dialog. In the ChangePassword screen designer, click Show As Dialog in the screen designer so that the change password screen appears as a dialog box rather than a separate web page. We will use Local Properties to provide edit fields for the old and new passwords. You can create a local property by clicking Add Data Item… in the screen designer toolbar, selecting Local Property, selecting a type, entering a name for the property and clicking OK. The property will then appear in the data item pane of the screen designer. Create four local properties, all of String type, called OldPassword, NewPassword, ConfirmNewPassword and ValidationResult. The first 3 will be editable fields for entering the passwords, the 4th property will be a text label used to report validation errors. Set the first 3 items to Is Required but not the ValidationResult. Drag each item from the item data pane into the layout designer. Set the three password fields as Text Boxes and the validation result as Text so that it appears as a label. Place the Validation Result item at the bottom, underneath the three password edit fields. Create a button, select Write my own method, call it UpdatePassword and click OK. This will create a button attached to custom code that we can fill in later to perform the password change. Now switch to the ViewUserProfile screen as we need to add a button here to navigate to the ChangePassword screen. Click on the Rows Layout group, click Add, and select showChangePassword from the Choose an existing method drop-down list. Change the Display Name of the button in the properties pane to something else if you like. If all has gone to plan, your screen designer should now look something like figure 4. We can’t call our existing OData endpoints to change a user’s password because they expect complete rows of data. Instead we have to create a new page which accepts the password data in an HTTP POST request and sends a response depending on whether or not the password change succeeded. From the Add New Item window, scroll down until you find Generic Handler and click on it once. Change the name at the bottom to ChangePassword.ashx and click Add. This adds a new endpoint at yourwebsite.com/Web/ChangePassword.ashx with some stub code that just returns Hello World by default. NOTE: If you want to change the handler’s class name after you have created it, you must also right-click on the .ashx file in Solution Explorer, select View Markup to display the XML for the handler and change the Class attribute of the WebHandler to match the new class name. You can now use serverContext just as if you were using this in your main LightSwitch code. Let’s see how we can use this to implement a change password feature in our generic handler. When you attempt to fetch the web page ChangePassword.ashx, the ProcessRequest method is invoked to handle the request. The HttpContext object supplied contains all the details of the HTTP request, crucially including any GET query string or POST parameters. These are stored in the Request.QueryString and Request.Form dictionaries respectively. That’s all there is to it. If you want to test the handler standalone, you can use Hurl to send a POST request as an authenticated user and check the response. This code sends an HTTP request to the URL specified in url, with a method specified in type (which can be get or post). The code does not block (it’s asynchronous) so you don’t have to wait for the HTTP response to come back. When the response comes, the success or error functions will be called. result will contain the body of the HTTP response. A promise is a variable or object which represents a value that is currently unknown, but will be determined later. The idea of promises is that you can define a function with some long-running operation (like waiting for an HTTP response), use the promise immediately (while its value is still unknown), and when the operation has completed, the value stored in the promise is filled in. Promises can be created in LightSwitch in a few different ways, but for direct use we employ the msls.promiseOperation method. This method takes one argument which is the function to execute. The function receives one argument known as a future object. When your long running operation completes, you call either complete() or error(errorThrown) on the future to notify the promise that the value is ready (or there has been a problem). Notice that we receive the future in operation and call the complete() and error() methods on it when the HTTP response has been received. We are now ready to write the code which connects the HTML Client to our ChangePassword.ashx server-side script. 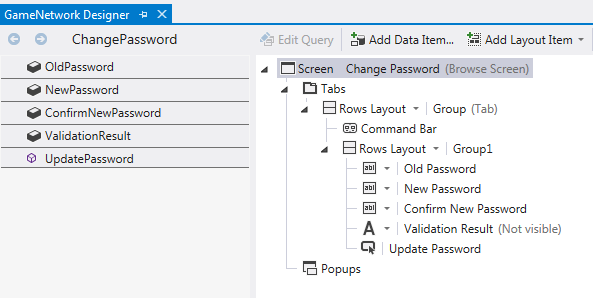 In the ChangePassword screen designer, right-click the UpdatePassword method we created earlier in the data item pane and select Edit Execute Code. If you recall, this method will be executed when the user clicks the Update Password button after entering their current and desired new password. Then we make the ValidationResult property visible in the dialog box (but it does not contain any text yet). By using the screen.findContentItem(string) method, we can access and modify any layout item on the screen. Here we set the isVisible property to true to enable ValidationResult to be rendered. Now we perform the client-side validation. First we check that all the fields have been entered. Although we set the Is Required property on these fields anyway, if any of them contain only whitespace they will slip through the net. Next we check that the NewPassword and ConfirmNewPassword fields contain the same text, and if not we fill the ValidationResult label with some notification text and return. NOTE: You will likely want to add extra validation here, such as checking the password lengths and complexities, as the error messages returned from the server are not very user-friendly. As you can see, we supply the fields the user has entered as OldPassword and NewPassword parameters in the POST request body. The promise object is returned to LightSwitch, and when the request has completed any changes made to ValidationResult are rendered on the screen automatically. If you have gotten this far, congratulations! Users can now edit their passwords via the web interface. There is, however, a problem. If you publish the project and try it, you will find that the password text is displayed un-obscured in the text fields. We want to mask the text entry so that each character appears as an asterisk (*) or dot. Unfortunately, LightSwitch does not provide such a text edit box among the built-in controls, so we have to roll our own. 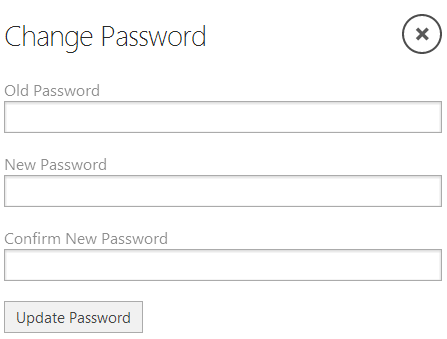 The first step is to open our ChangePassword screen in the LightSwitch Designer, then click on the drop-down arrow next to the icons on each of the three fields Old Password, New Password and Confirm New Password and change the content type from Text Box to Custom Control. There is quite a bit of new material here so let’s look at it line by line. The first line in the function body creates an HTML <input> tag which is the text edit box. This will render with exactly the same appearance as a standard LightSwitch text box because the CSS for the page defines a default appearance for all <input> tags, so we don’t need to worry about the control looking different to the standard controls. Crucially, setting the type attribute to password causes the contents of the field to be masked with asterisks – a built-in feature of HTML’s <input> tag. The call to $() invokes jQuery to create a DOM representation of the text version of the <input> tag we just created. This is the representation we need in order to insert it into the HTML document. password.appendTo($(element)); again invokes jQuery to insert the tag into the document as a child of element. LightSwitch sets element for us so that the custom control shows up at the right place on the page. The password.change() line defines what will happen when the user modifies the text in the <input> field. We compare the value of the field to its corresponding LightSwitch field, and update the LightSwitch field if they don’t match. In this way, whenever the content of the <input> field changes, the LightSwitch field will be updated to have the same value automatically, thus keeping them in sync. The contentItem.dataBind() line does the same thing but the other way around: if the LightSwitch field value changes, password.val(newValue) changes the <input> field to have the same value. This technique of updating one of two pieces of data to match the other whenever one of them changes is called bi-directional data binding and is very common in applications with user interfaces. In a Windows appliation for example, a Windows TextBox control may be bound to a C++ string and a CheckBox control may be bound to a bool in your application. If you now re-publish the project, log in and go to the change password dialog, you will see that the password fields are masked with asterisks, but if you change your password, log out and try to log in again, the password has been correctly changed. This creates a very simple endpoint on our site – /Web/GetUserName.ashx – which simply outputs in plain text the name of the currently logged in user. We can now use the techniques we learned above using jQuery and promises to call our ChangePassword handler from the client to call GetUserName and display the result somewhere on a page. The function CallGetUserName uses the jQuery AJAX technique discussed earlier to call our GetUserName generic handler (with no parameters – the data field is empty) and return the result. The myapp.Welcome.created function – which is called when the Welcome screen loads – creates a promise which calls CallGetUserName, fetching the result (the name of the logged in user) into a temporary variable named currentUser then sets the title of the page to show it (note how you can modify screen.details.displayName to change a screen’s title). Re-publish the project and you will find that when you log in, your username will be displayed in the title of the Welcome screen after a short delay while it is fetched from the server. Let’s round off this epic adventure in LightSwitch user interface creation with a look at some simple tweaks you can apply to give your site a slightly more unique appearance. In File View, open GameNetwork.HTMLClient -> default.htm. This page is used as the base template for all the pages and dialogs in the HTML client, so modifying it will modify the appearance of all pages. You can change the HTML page title (that which appears in the browser window’s title bar) by modifying the <title> tag. I used “Simple Gaming Network” (without quotes) as the text here. You can change the text that appears at the bottom of the loading screen by modifying the contents of the <div> inside <div class=”ui-bottom-load”> in the page body. Once again, I used “Simple Gaming Network” as the text. Of course, you might want a customized theme. LightSwitch supports CSS files (“themes”) made with the jQueryMobile ThemeRoller web tool. With this tool you can visually tweak the styles you want to use on the site, then download an auto-generated CSS file which replaces the default LightSwitch CSS. For more information see Creating a Custom Theme with ThemeRoller in the jQuery online documentation. You don’t need any jQuery knowledge to do this, just an idea of how CSS works! For the sake of this article, I have simply switched the project to use the built-in dark theme. The user-logo.png and user-splash-screen.png files contain the graphics used in the top-left corner of each page (by default) and the centre of the loading splash screen page. These can be found in File View under GameNetwork.HTMLClient -> Content -> Images. Simply replace them with graphics of your choice to customize them. Notice that the files must be PNGs and they must be of the correct size. A useful free online tool for converting and scaling to PNG can be found at Images.My-Addr.com for those of us artistically challenged folks who don’t have an image editor installed. I hope you found this guide comprehensive and helpful! Now that we have a working web interface that allows users to view and edit their profiles, we shall in Part 4 see various ways to write code in C++ to handle log in and registration from our game code so that a user doesn’t need to use their web browser to sign up or sign in, as well as generic table queries, inserts, updates and deletes plus a simple C++ client class framework for your game network code. You’re most welcome 🙂 These comments make it all worthwhile!